The International Water Portal is a joint effort of the United Nations and the Prince Sultan Bin Abdulaziz International Prize for Water (PSIPW). It is a comprehensive online forum and database for all parties that are professionally involved with water. It combines the functionality of a professional database, an online digital library, and a professional networking site. The portal can be accessed at: http://water-portal.com/ . The water portal was originally envisioned as a water professional database, which would host information about water researchers from around the world. It was commissioned as one of the resolutions published at the United Nations 1st International Conference on the Use of Space Technology for Water Management which was held in Riyadh in 2008 and co-organized by UN-OOSA, UNESCO, Prince Sultan Bin Abdulaziz International Prize for Water (PSIPW), and the King Abdulaziz Center for Science & Technology (KACST). After preliminary development of the database by the PSIPW team, the vision expanded to being an interactive database for water research, water organizations, companies, and water professionals, with added networking functionality where water specialists can contact one another, exchange information, and add to a searchable online water library. The Water Portal's goal is to gather together all parties involved in the water issues in one place to enhance international cooperation, communication, and access to information. This new vision was presented by the PSIPW delegation at the following meeting of the Committee for the Peaceful Uses of Outer Space (COPUOS) in Vienna in 2009, where it was endorsed, adopted, and renamed as the International Water Portal. It was agreed the portal will be hosted by PSIPW. 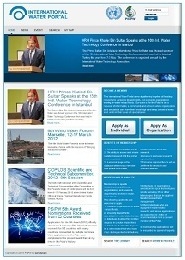 The International Water Portal was officially launched during the COPUOS Scientific and Technical Subcommittee meeting that was held in Vienna Austria from 6-17 February 2012.